There is no single practice for Humanistic Pagans. The religious practices of some Humanistic Pagans may be outwardly indistinguishable from other Pagans, including casting “spells”, and prayers and offerings to “gods”, while other Humanistic Pagans may not use theistic symbolism in ritual. Humanistic Pagans often can easily practice alongside other kinds of Pagans. Many observe some form of the Neopagan Wheel of the Year. Jon Cleland Host brings science and Paganism together in his unique family celebrations. Some Humanistic Pagans turn seemingly mundane activities – like making stock, crafting or composting – into religious practices. 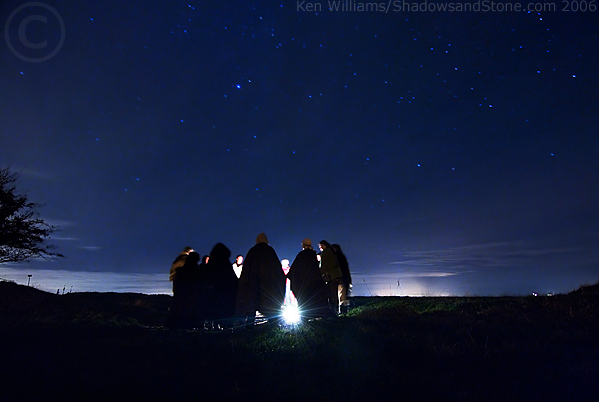 Other Naturalistic Pagans join Pagan organizations, like the druid fellowship ADF (Ár nDraíocht Féin) or the Order of Bards, Ovates, and Druids (OBOD), which include naturalistic and non-naturalistic Pagans. Or we create our own traditions, like Rua Lupa’s Ehoah, WhiteHorse’s Druidic Order of Naturalists, and Mark Green’s Atheopaganism (also a Facebook group). Humanistic Pagans also seek to learn about the natural world through scientific inquiry and direct experience. We also meditate and read mythology for inspiration and insight. And we work to improve both themselves and society through responsible action. Ritual enables us to cultivate certain subjective states of mind which are personally healing and socially and environmentally integrative. This is especially important in our time of widespread spiritual alienation. Ritual can also give rise to experiences which help motivate socially- and environmentally-responsible behavior.